The location was on the Montrose Off Ramp from Rt 270 in Rockville Maryland. The "Take It!" 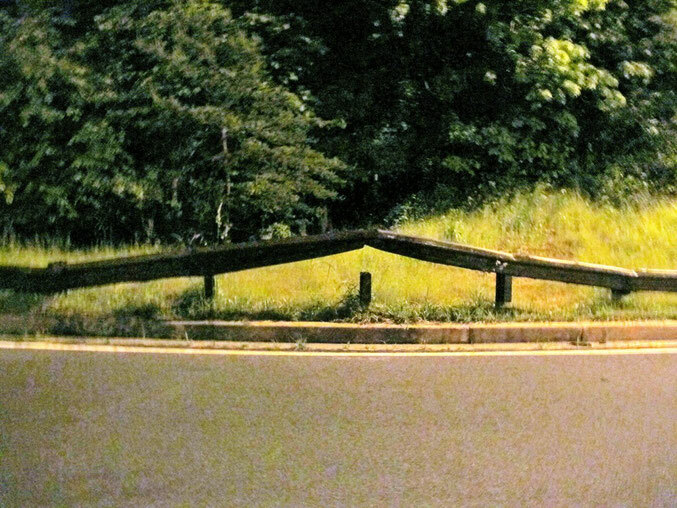 came from looking at many miles of guard rail in my travels and never having seen one that had this sort of a 'from the bottom up' hit to it. It was one of those ponderables that just would not go away. I do not think I am alone in rendering guard rail whomp marks as being totally irrelevant. Heck there seems to be a new one that appears every so often and upon rare occasion we actually see the incident that caused the shape bending in the metal put there for our protection. Oh, this is not to say each does not have its own story, it is just that it is a part of what happened to someone else and it has nothing to do with me; so why even think about it? The After Take: Every great once in a while I pass by a highway team that is out there doing repairs to guard rails. This never seems to be just a couple of workers with some shovels and a pickup truck. Nope, it is a full set of trucks and a bunch of workers all seemingly with specialized skills out there getting this important repair job done. The job site is well announced with many signs on the road side, many times the announcement that something is happening is seen way in advance of the signage as traffic slows. Sometimes the outside lane is closed to accommodate the workers and their equipment. Without going into what all the stuff is that is out there, what remains is sometimes a color difference showing off the newly installed metal which may fade from memory in a few days. So, this is one of those tribute moments. I give thanks to all those who work on these crews that take away all these reminders of a bad moment for someone that could have been worse had their handy work not been there in the first place. Thanks again, and as many say "keep up the good work." Here is hoping the seemingly little whomps in your life get fixed so quickly that they too can become not even a memory. Thanks for joining us for the current photo presentation. You are cordially invited to return Friday, June 15th for a new picture that we hope you will enjoy. That is an odd angle. You are right though, more often then not those dividers are put there to prevent a much worse accident. That one loks like it has plants growing on it. Maybe it hasnt been replace in some time. At least whatever accident it was doesn't look like it was too severe. Ya there is some plant life growing on that. I'm sure there is some sort of wordage one could think of about life finding a way where disaster once struck.